This unique stingray is named for its preference for a pelagic habitat, the open sea instead of near shore or ocean bottom, like most stingrays. It has a dark purple to blue-gray, wedge-shaped pectoral disc, which it flaps to ‘fly’ through the water, and can grow to over 30 inches wide. The tail is twice the length of its body and armed with a spine that is believed to be significantly more venomous than other stingrays. Because of its open sea habitat, it doesn’t often come in to contact with humans, but caution should be used when handling this stingray because of its venomous spine. English language common names include pelagic stingray, blue stingray, Guilers stingray, stingray, and violet stingray. Other common names are boll (Maltese), boll tork (Maltese), ferraccia (Italian), glafkotrygona (Greek), ignelivatoz (Turkish), karasu-ei (Japanese), ogoncza pelagicza (Polish), pastenague (French), pastinaca (Spanish), pastinaca violacea (Italian), Peitschenrochen (German), pelagiese pylstert (Afrikaans), pigrokke (Danish), pilrokke (Norwegian), pilskate (Norwegian), prelato (Italian), raya látigo pelágica (Spanish), siba zutulja (Serbian), sinikeihäsrausku (Finnish), Stechrochen (German), stingrocka (Swedish), trigone violetto (Italian), trigono (Italian), uge-violeta (Portuguese), violette pijlstaartrog (Dutch), violetter Stechrochen (German), and volina (Serbian). Although not a commercially important species, the pelagic stingray is often caught as bycatch on pelagic longlines and drift nets. 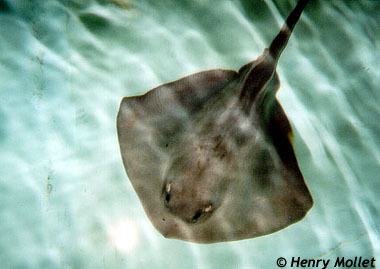 In waters off the Hawaiian islands, this ray is often a bycatch of the tuna fishing industry. Pelagic stingrays are also bycatch in the California and Oregon drift gill net swordfish fishery. There is one or more venomous spines located about a third of the way down the tail which are defense weapons against potential threats. It is believed that the venom of this ray is particularly potent due to the avoidance behavior exhibited by other fish nearby. The danger to humans is minimal due to the pelagic habitat of this species. However, caution must be taken when handling this ray to avoid injury from the venomous spines. > Check the status of the pelagic stingray at the IUCN website. The pelagic stingray is distributed worldwide in tropical to temperate waters between 50°N – 50°S latitudes. It has been reported in the Mediterranean and off Cape Verde in the eastern Atlantic Ocean. In the eastern Pacific Ocean it has been documented in the waters of Hawaii, Canada, California, Mexico, Chile, and the Galapagos Islands. 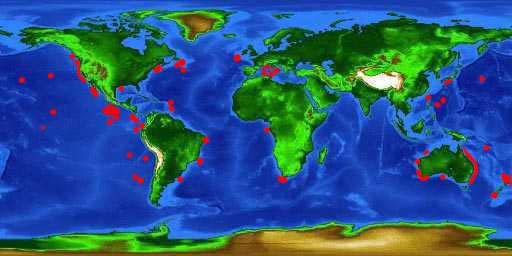 Other reports include off the coasts of western and southern Africa and southern Japan as well as Tasmania and Australia and numerous others (see distribution map below). In contrast to other rays, the pelagic stingray is found in open ocean waters and inshore bays rather than buried in sandy bottom shallow waters. Usually found in the top 330 feet (100 m) over deep water, this ray has been reported to depths of 780 feet (238 m). It swims by the undulation of the pectoral fins which is typical of stingrays. The pelagic stingray has a broad wedge-shaped disc which is wider than long. The snout is broadly rounded with the presence of a terminal lobe. The small eyes do not protrude from the body as in other rays. The tail measures up to double the length of the body with a long lower caudal fin fold that terminates in front of the tip of the tail. There is no upper fin fold present on the pelagic stingray. The front margin of the pelvic fin is straight while the outer corner is broadly rounded. The tail has a thick base, tapering to the origin of the serrated spine. There is one or more venomous spines located about a third of the way down the tail which are used for defense. The dorsal surface of the pelagic stingray is dark purple or blue-green while the underside is purplish to gray. There are no distinguishing markings. This makes it difficult for predators to see this ray from above since the dark coloration blends the ray with the dark ocean waters below. The upper jaw projects slightly at the symphysis while the lower jaw is slightly indented. Dentition of the pelagic stingray differs from most other stingrays by the presence of cuspidate teeth in both males and females. The ridges of these teeth are used for cutting very unlike the typical crushing dentition associated with most stingrays. 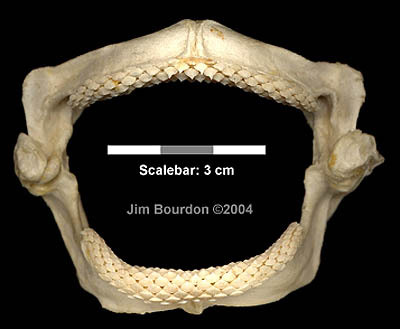 The upper jaw band has 34 files of teeth on each side (17-17) at the same stage of development and the lower jaw has nineteen rows of teeth on each side of the symphysial tooth (19-S-19). The floor of the mouth has a row of 10-12 fleshy papillae. Large individuals are covered dorsally with denticles while lacking denticles ventrally. There is a row of thorns from the nuchal region to the tail spine origin. The pelagic stingray has three distinct types of denticles on the surface of its body. One type is small with a branched base, unconnected branches, and circular crown. Another, which is most abundant, has interconnected branches along with a circular crown. The remaining denticles have crowns that are antero-posteriorly elongated and laterally compressed. The base is either elongated or circular. The pelagic stingray is a relatively small ray reaching a maximum size of 31.5 inches (80 cm) disc width and 63 inches (160 cm) total length. In captivity, females may reach much larger sizes, measuring up to 39 inches (100 cm) disc width and weighing around 110 pounds (50 kg). Male pelagic stingrays reach sexual maturity at 13-16 inches (35-40 cm) disc width and females at 16-20 inches (40-50 cm) disc width. Analysis of stomach contents of the pelagic stingray revealed that their diet consists primarily of planktonic crustaceans in the form of euphausiids and amphipods. 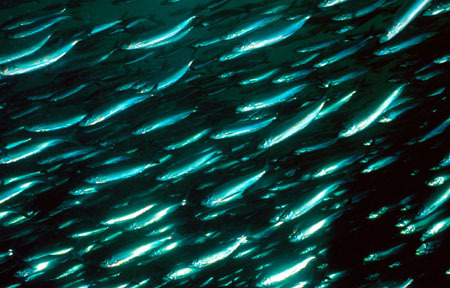 Other food items includes jellyfish, squid, octopus, shrimp, and small pelagic fishes such as herring and mackerel. It sometimes uses its enlarged pectoral fins to move food into its jaws. The pelagic stingray development is ovoviviparous with the eggcase retained within the uterus and the embryos hatching at an early developmental stage. Each egg is rather small, weighing 1-1.5 grams and about 0.4 inches (1 cm) in diameter while at birth the embryo weighs about 100 times more. First, the embryos are nourished by a yolk-sac and are probably still inside the eggcase. Apparently they hatch before all the yolk in the yolk-sac has been used up and at this stage uterine milk is supplemental. However, at a disk width of 2 inches (5 cm) or sooner, the egg-yolk is completely used up, with the nourishment supplied entirely from the rich uterine milk, also called “mother’s milk”. After a gestation period of 2-4 months, the female gives birth to four to nine young with each pup measuring 6-10 inches (15-25 cm) disc width. Parturition (birth) occurs in the western and central Pacific Ocean in November through March in warm equatorial waters while in the Mediterranean the birthing season occurs in August and September. 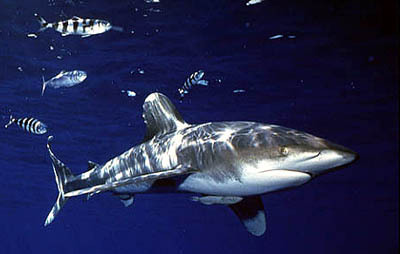 Potential predators of the pelagic stingray include large carnivorous fishes such as the oceanic whitetip shark (Carcharhinus longimanus). One known parasite of the pelagic stingray is the monogean trematode Entobdella diadema which has been observed infesting the skin of individuals maintained in aquaria. 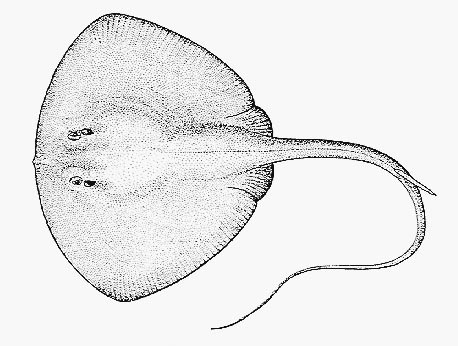 The pelagic stingray was originally described and named Trygon violacea by Bonaparte in 1832. Subsequent workers on Dasyatidae phylogenetic relationships proposed other generic affinities for Bonaparte’s species. These include Dasyatis violacea and most recently Pteroplatytrygon violacea, the currently valid name. The genus name, Pteroplatytrygon, is derived from the Greek word “pteron” meaning wing, fin, “platys” meaning flat, and “trygon” meaning stingray. The species name violacea is derived from the Latin “viola” meaning violet. Synonyms appearing in past scientific literature that refer to this species include Trygon purpurea Müller & Henle 1841, Dasyatis purpurea Smith 1841, Dasyatis purpurpeus Smith 1841, Dasyatis atratus Ishiyama & Okada 1955, and Dasyatis guileri Last 1979.